Halve, between 1990 and 2015, the proportion of people whose income is less than $1 a day. Achieve full and productive employment and decent work for all, including women and young people. 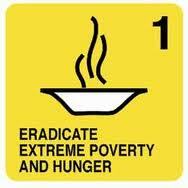 The vision of this MDG is to fight poverty and hunger. The objective is to reduce by half the number of people living with less that 1 dollar (€0,75) per day and the number of people suffering with hunger. In which stage are we in? The financial and economic crisis coupled with the food and energy crisis had a significant impact on the poverty reduction target. In 2012, there are nearly 1 billion people that go to bed hungry. Quick translation: one in seven people goes to bed hungry every night. And why is that? People and governments are committed to change, but there is a need to treat not only the disease but the causes. Unequal distribution of resources in the world economy, overpopulation, unemployment, inadequate education, environmental degradation, corruption, bad governance, and conflict are some of the causes of poverty. We need to make clear efforts to eradicate the causes of poverty, which includes the adoption of a new lifestyle. Only half of all countries are on track to achieve the MDG target, the majority of them middle-income countries. Nevertheless, it is expected that by 2015 the global poverty rate will fall below 15%, meaning that this MDG will be targeted. Poverty, however, does not affect every region of the world equally. In Latin America 11% of the population live with less than one dollar per day. This number rises to 49% in Sub-Saharan Africa. In the 21st century we can do more and better to eliminate poverty and extreme hunger in the world. What to tell Young Modern Performers about this MDG? YMPs are not likely to become activists against global poverty in a political sense. But other ways to contribute for (not only) YMPs are, for example, to not invest money in food stocks, which only leads to more speculation on the global food stock markets. Other options are to help increase the income of working families in developing countries by, for example, avoiding dumping products and instead buying fair trade products.